The WineKeeper system allows dispensing your wines like a professional. Your wine is preserved by a blanket of 100% nitrogen. This stops the oxidation process and is a totally inert gas. 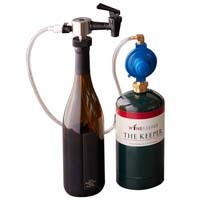 We carry a full line of WineKeepers from a single bottle system up to 16 bottles. Please call with any questions on wine preservation.